Putting a price on comfort. Performance: Does it pay off? Anyone who’s followed HyperX for the past few years and saw last year’s Cloud Revolver knew what was coming next: the HyperX Cloud Revolver S. It’s a familiar pattern for the company nowadays—first the stereo version of a headset and then, about a year later, the USB-enabled version with surround sound. And that’s exactly what we’ve got here. The Cloud Revolver S takes last year’s design, adds in a USB sound card and 7.1 surround support, a chat mixer, and tacks on a premium price ($150 on Amazon). So is it worth it? The design of the Cloud Revolver S is almost identical to last year’s model, aside from a white-and-black color scheme in lieu of the its predecessor’s red and black. 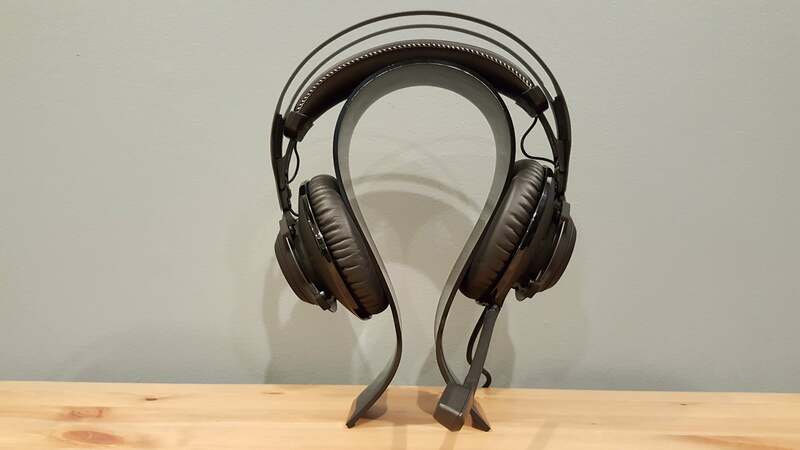 Eschewing the solid headband of the standard Cloud headsets, the Revolver models use a SteelSeries Sibera-esque floating band—a metal frame arcing effortlessly above a tensed piece of padded leatherette. 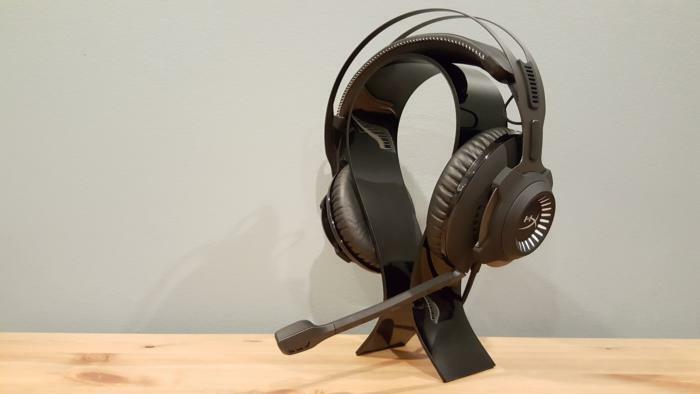 Like the original Cloud Revolver, the S model is incredibly comfortable—even more than the original Cloud actually, which itself is still one of the most comfortable headsets on the market. I occasionally noticed its clamp on my jawline, but it was firm, not painful. And the tradeoff? No pain on the crown of the head, nor any real pressure on the ears. It’s a joy to wear, and HyperX’s generously padded earcups are still some of the most luxurious in the industry. The downsides also come straight from its predecessor. One, it feels fragile—a consequence of all these floating headband designs. Two, there’s still a weird “reverb” noise triggered by any contact with the metal headband. It’s like a tuning fork wired directly into your ears, and something as innocuous as scratching an itch on your head can send raspy metallic noises through the headset. The effect has been minimized a bit by two new rubber bits at each end of the headband, but it’s not gone completely. Don’t get your hopes up for a full redesign—the Cloud Revolver S still uses an inline box embedded awkwardly far down the headset cable. I still think HyperX’s next model needs controls built into the headset itself to stay competitive. But I’ll say this: The Cloud Revolver S’s control box is a hell of a lot nicer than the standard Revolver’s. Even the size is better, with the S box’s larger case making it infinitely easier to find it in the heat of the moment. 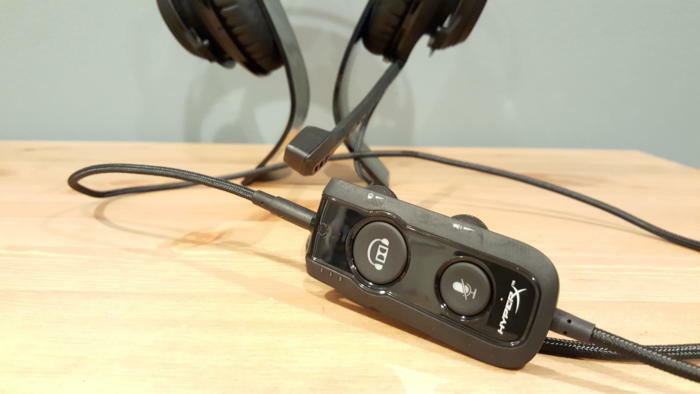 Controls are also larger, easier to operate, with a prominent mic-mute button and Dolby toggle on the facing edge, separate headset and mic volume wheels on the right side, and an EQ cycler on the left. Is it the best solution I’ve ever seen? No, but it’s certainly the best control box HyperX has put out to date. That’s not a huge bar, but I’ll take what I can get. As I said, the control box also houses HyperX’s sound card and the 7.1 implementation—the most noteworthy difference between the S model and the standard Revolver. So how does it sound? Well, the undoctored audio is as good as ever. Like the original Revolver, the S model has an ultrawide soundstage with a bit of a mids boost that gives it a fun, lively output for both gaming and music. 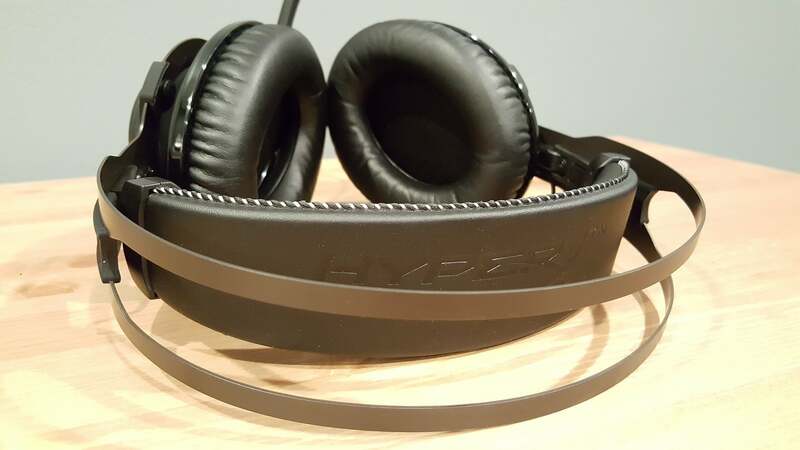 It sounds at least as good as the original HyperX Cloud if not better, which is impressive considering we’ve recommended the Cloud for going on four years now. You can also cycle between four different EQ settings on the box. The standard setting (no lights illuminated) sounds, to my ears, pretty similar to the original Revolver, while the other three are listed as Bass Boost, Flat, and Vocals EQ, or in other words, a more significant mids boost. It’s not as flexible as being able to adjust EQ in software, but on the other hand, purists will be happy they don’t need to install yet another program for a single peripheral. The hardest part of HyperX’s strategy is judging whether 7.1 surround is worth the premium price of the Revolver S. Like the Cloud/Cloud II, the Revolver already sounds really damn good in stereo. Like, really good. Adding 7.1 surround is a nice back-of-box feature, but virtual 7.1 never sounds that great anyway and it’s even less impressive when compared to the Revolver’s solid stereo output. Which is not to say the Revolver S’s 7.1 is bad. While not as rock-solid as Logitech’s virtual surround, the Revolver S performs as advertised and simulates directional sound a smidge better with Dolby enabled. I just don’t know if it’s worth an extra $30. It also does this weird thing where the volume boosts by a significant amount when you enable Dolby. Maybe it’s just an accidental side-effect of HyperX’s surround implementation, or maybe HyperX did it on purpose to avoid the “hollowed out” echo-chamber I associate with virtual surround sound—by boosting the volume, it helps the 7.1 output sound as strong as the stereo output. In any case, the result is a noticeable increase in volume when you hit that Dolby button, which I’m not a huge fan of. I also suspect the box adds some noise cancellation to the microphone, same as the Cloud II. At the very least, my test recordings with the Cloud Revolver S sound a bit clearer than the original model, and I can only really chalk that up to better noise gating in the USB sound card. It might not make a huge difference—the microphone is still just okay in regards to quality of voice reproduction. But at least now it doesn’t catch every single plosive. The end result: It’s hard to say whether the Cloud Revolver S is worth it. HyperX made its name off affordable peripherals, but at $150 the Revolver S is one of the most expensive wired headsets on the market. 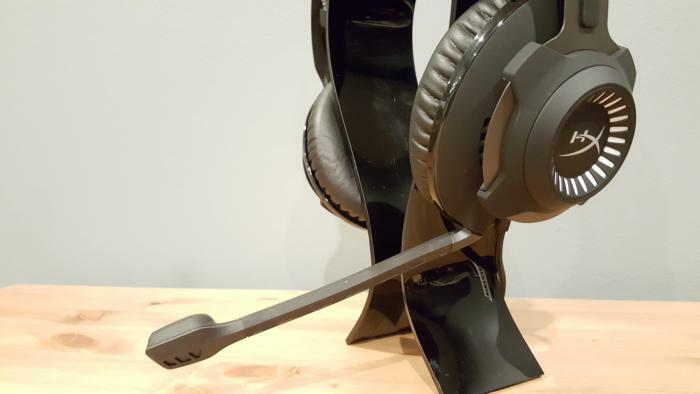 Logitech’s G633, Razer’s Man O’ War, SteelSeries’s Arctis 5—these are all excellent headsets at a much lower price. Hell, you can get Logitech’s and SteelSeries’s wireless headsets (like the G533 and Arctis 7) for less than the wired Cloud Revolver S.
That’s a tough sell. If you’re a devoted HyperX fan, the Revolver S does have some nice features: It’s a bit more adaptable than the original Revolver thanks to the extra EQ settings, the microphone sounds better, and you do get (for what it’s worth) virtual 7.1 support. But like the Cloud II before, it’s a bit hard to recommend the S model over the standard Revolver, and even harder to recommend it over the $80 Cloud—to say nothing of all the Revolver S’s similarly priced competitors.